Step:1st- Front office management software manages school visitor, school enquiry, and school complaint candidate record. so please select front office option and manage record. Step:2nd- Add call information in the front office management software. first of select user response and adds the mobile number, follow up date, user name, address etc then click the add button. Step:3rd- User call list shown. search any user number so please enter mobile number in the search box and click the enter button. if add any follow-up record in call & follow-up system please click calling button. Step:4th- Add user follow-up information in front office management software so please select follow-up date then select next follow-up date. enter user response and remark and click the add button. Step:5th- Follow-up user detail show .you have to edit and update follow-up user information please click edit button then change user information. Step:6th- Change Follow-up user information like follow-up date , next follow-up date, remark and click add button follow-up detail update successfully . Step:7th- Delete follow-up user information. Step:8th- Click edit button change and update user calling information. Step:9th- Update user response, mobile number, follow-up date and other information click add button. user calling detail update successfully. Step:10th- Click the cross button and delete user information in front office management software .click print option and user calling list pdf file generate. Step:11th- User calling information print in PDF format. Step:12th- Add other calling information please click other call option and add user name, mobile number follow-up date then click the add button. user information saves successfully. Step:13th- Other User call list shown. search any other user number so please enter mobile number in the search box and click the enter button. 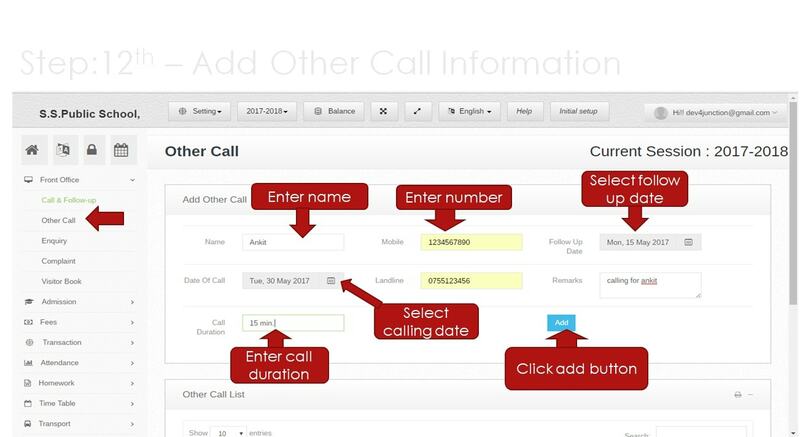 if add any user follow-up record in Other call systems please click calling button. Step:14th- Add other call follow-up user information please select follow-up date, next follow-up date, fill follow-up response and click the add button. Step:15th- other Follow-up user detail show .you have to edit and update follow-up user information please click edit button then change user information. Step:16th- Change other Follow-up user information like follow-up date, next follow-up date, remark and click the add button. follow-up detail update successfully. Step:17th- Delete other follow-up user information. Step:18th- Click edit button change and update other user calling information. Step:19th- Update other user response, mobile number, follow-up date other information and click add button user calling detail update successfully. Step:20th- Click the cross button and delete other user information .click print option and other user calling pdf file list generate. Step:21st- Other User calling information print in PDF format. Step:22nd- Add Enquiry calling information please click enquiry option and select enquiry type, add user name, address, mobile number, select response type and add other information then click the add button. Step:23rd- Enquiry call list shown. search any enquiry user number so please enter mobile number in the search box and click the enter button. if add any follow-up record in enquiry system please click calling button. Step:24th- Add enquiry follow-up user information please select follow-up date, next follow-up date, and fill user follow-up response then click the add button. Step:25th- Enquiry Follow-up user detail show .you have to edit and update follow-up user information please click edit button then change user information. Step:26th- Change enquiry follow-up user information like follow-up date, next follow-up date, remark and click the add button. follow-up detail update successfully. Step:27th- Delete enquiry follow-up user information. Step:28th- Click edit button change and update enquiry user calling information. Step:29th- Update enquiry user response, mobile number, follow-up date other information and click add button enquiry user calling detail update successfully. Step:30th- Click the cross button and delete user enquiry information. click print option and other user calling pdf file list generates. Step:31st- Enquiry User calling information print in PDF format. Step:32nd- Add user complaint please click complaint option and select complaint type, add complaint description, add complaint action, enter the mobile number and add user name then click the add button. Step:33rd- Complaint user list show. search any complaint user number so please enter mobile number in the search box and click the enter button. If you change complaint detail please click edit button then change complaint information. Step:34th- Update and change complaint information like complaint type, update complaint description, complaint action, update mobile number and user name then click the add button. Step:35th- Click the cross button and delete complaint information. click print option and compliant user calling pdf file list generates. Step:36th- Complaint user calling information print in PDF format. Step:37th- Add Visitor information please click visitor book option and select visit purpose, add visitor name, mobile number and fill description then click the add button. Step:38th- Visitor user record show. please click edit button then change and update visitor information. Step:39th- Edit and update visitor information like visit purpose, visitor name, mobile number, description and click add button.visitor information update successfully. Step:40th- Delete visitor information please click the cross button and delete visitor detail.print visitor detail pdf file then clicks print option. Step:41st- Visitor information print in PDF format.